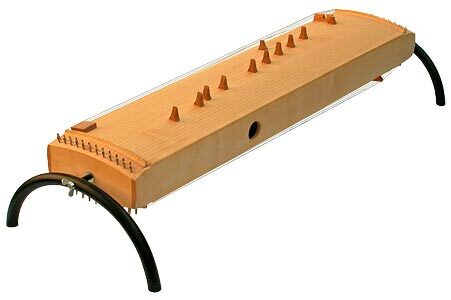 This polychord can be rotated along its axis and is actually three music instruments in one. On one side, the polychord has 24 strings tuned to the same note which, when played as a chord, emit a sound with a manifold overtone spectrum. On the other side, four strings are reserved for the Indian tanpura with its typically delicate clanging sound rich in overtones. 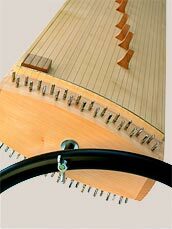 The remaining 20 strings can be tuned to individual scales by means of the movable bridges, similar to the Japanese koto. The instrument is ideal for meditative, improvised music. For the scientifically minded, the polychord renders valuable service for studying the interaction of intervals and proportions. With the aid of polychords, Johannes Keppler discovered fundamental laws of proportion in the universe. Oscillating length 120 cm (47 inches), length of instrument 144 cm (56.5 inches), length with stand 152 cm (60 inches).